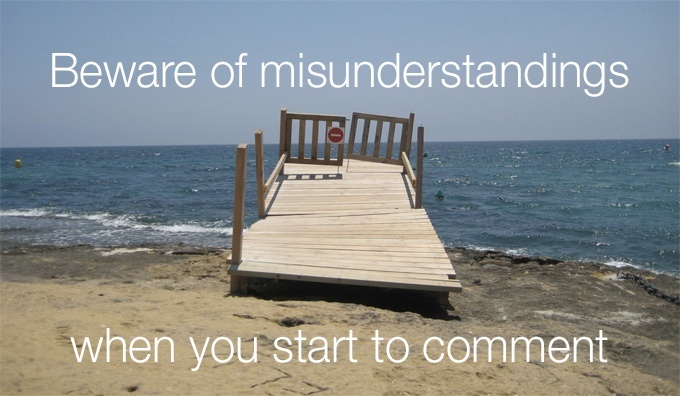 It's a good idea to try to avoid any misunderstandings when you start to comment. Especially if you're naive like me. I have a narrow perception of the world out there. In reality it is cold, ruthless and cruel. I'm afraid that is the nature of commenting these days – which is quite sad. I was suggested a challenge to start commenting on LinkedIn. The objective was to get more eyeballs on your profile by contributing at least two comments a day. Not a difficult task, I thought. So I decided to give it a whirl. Now I had been warned about people on LinkedIn. They have a tendency to want to continuously push their business really hard. After all, LinkedIn is a business networking platform, isn't it? It's a place to tout your business and/or services, isn't it? This is the first of the misunderstandings when it comes to commenting on a platform like LinkedIn. Thrusting your business in front of someone's face and shouting "Buy!" isn't networking as far as I'm concerned. When this happens, I usually reach for the delete button. And I wonder how many other people have the same reaction as me? Everything happened after I had updated my profile to include The Commenting Club. This resulted in a rush of people congratulating me on my new 'job', as LinkedIn's automated system swung into action. This annoyed me, the second of the misunderstandings. This isn't a new 'job', but an extension of my business. However, one good thing was I was able to reconnect with an old friend who was genuinely quite interested, and wished me well. Which was very nice. So I replied, leaving a link to The Commenting Club. At least this was in keeping with the reason for the automated interaction. He replied saying it looked quite good. Which was promising. My hopes had been slightly raised. I asked him which post has related most to him. He replied the one with the cat. Puzzled, I noted only one post had a cat as its featured image. Further questioning confirmed he was a cat lover. Hmmm. At this point I should have realised this was going nowhere, and should have bowed out gracefully. I had forgotten I was commenting on LinkedIn and not Facebook. This was the wrong environment for such a conversation. People on LinkedIn only have one thing on their mind: to promote their businesses. Which is immediately what he did in his next response. His love of cats kept him sane while he worked on his business. And again there was his link to his website. What rankled me was that my club had nothing to do with cats, and he was trusting his website into my face with no connection. This felt a bit spammy. Then I reprimanded myself for being so foolish. Obviously this man had no intention of checking out my club. All he wanted to do was to get me to look at his website. I realised we were both behaving wrongly. We were not networking in the correct way. We were succumbing to the tyranny of demanding instant gratification. I was naive to think he would be really interested in The Commenting Club. A complete stranger out of the blue? Hardly. His motivation was to get another person to look at his website. He even later sent a screenshot to show how successful is website was, within his industry. Which I equally had no interest in. So this conversation had failed. It didn't even have a chance to get off the ground. We are all impatient to succeed in our businesses. Or have sales bosses breathing down our necks demanding you to close the sale right now! However, another one of our misunderstandings is that networking is not a quick fix solution. It has to happen over a long period of time. We have to work on our friendships, which is more than just acquaintances, to succeed in business relationships. It's the same online as it is out in the field at networking groups. People buy from people, but only those we know, like and trust. That's not going to happen in just five minutes! Commenting is a phenomenon that usually happens staring at a screen, rather than at someone's face. This is another cause for misunderstandings. You can't read the facial expressions of the person you're communicating with. The signals that they aren't interested or are bored are invisible. All this has to be interpreted through a series of words. Therefore commenting for networking reasons is notoriously difficult. We almost all fail at it in some way almost every day. How many times have you started a conversation, only to have it fizzle out due to misunderstandings? There is every reason why we should be able to succeed in commenting networking. We need to learn to comment to find out more about the other person first. Then gradually move onto about their business and how it can help you and others you may know about. This has to be done in very small stages. A compliment here. Showing appreciation there. Congratulating here. Asking a question there. Over a long period of time. Gradually, as you begin to understand the other person, then you will be able to recommend their business to others if it is not applicable to yourself. I found going to networking meetings a time drag and a drain on my resources. It's time-consuming as having to make small talk at a lunch with totally unsuitable business people. Most of my day was taken up driving to the venues, and the lunch costs didn't result in enough business to counteract it. I saw the same ladies every month, graciously met new recruits, but my heart sank when I realised my 'minute' pitch was invariably falling on deaf ears. You do need time to thoroughly read the post or totally understand the update, before you submit your response. But that doesn't take all day! Neither should the process of writing a constructive and valuable comment in return. And you will have focused your efforts on a potential recipient who would be more likely to respond favourably. All you need is the right approach: sensitively, empathically and relevantly. All this would work better if this benefited everybody in the long run. Even if it did lead only to alleviating a misunderstanding that this man was a cat lover which kept him sane while he was succeeding in his business. I read (promise!) and enjoyed your post. I was particularly pleased to find a like-minded person regarding in-person networking meetings. Although I enjoyed meeting new people, I soon realised that I was going more for a good chat and a cuppa than to grow my business through networking, so I no longer go to them. On the other hand, I write comments only when I have something to say, and when I have time to say it, so they’re more targeted. Thank you for your comment Alison. The trouble with offline networking is it is so generic. It’s difficult to pin down relevant people. Whereas online you can focus much more succinctly at an ideal prospect. And you have the time to think carefully about the right thing to say, making it as relevant as possible to them and their business. Much more likely to achieve success that way. Thank you for sharing your experience Alice. It’s a great reminder not to focus on the outcome, but rather the moment and trying to contribute in a meaningful way when commenting. I too have had my hopes up and felt foolish, but I’m committed to the long term and building relationships the right way. Thank you for your kind words, Alice. I’m glad I’m not the only one who looks foolish when misunderstanding a commenting conversation. As you say, never mind, dust yourself off, and continue onwards and upwards. Really great post Alice that totally resonated with me. Sending you a link to his website on the first comment is akin to having a business card thrust at you during a networking event! Thank you for this post. Really enjoyed it – like your writing style too! Thank you Shelley for your comment. Yes, you’re right, people still have to learn manners when it comes to commenting. It seems that even the simple act of how to approach someone properly has gone out of the window! Everything is so ‘me me me’ when it really needs to be ‘you you you’.